IT is forced with securing consumer-oriented devices which are accessing corporate email, networks, and 3rd party applications. This end-user panel will provide you with a look at how some of the top IT shops are dealing with this urgent issue and how you can leverage their best practices at your own organization. 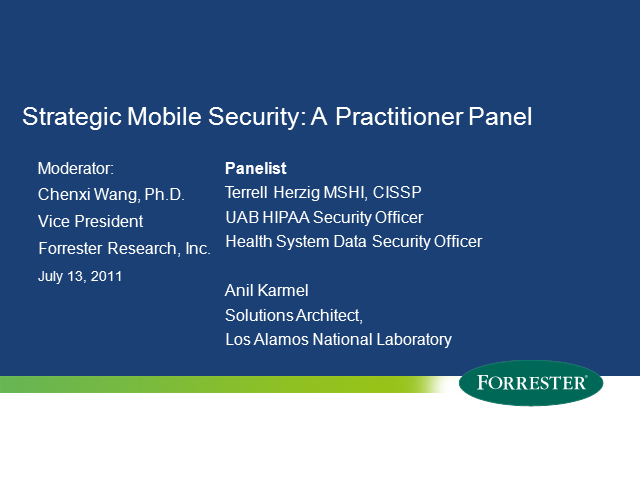 Moderator Chenxi Wang of Forrester will provide an overview of the trends she is seeing from both a practitioner and solution perspective, and will lead the end-user panel in a discussion of various strategies to successfully implement, manage, monitor and secure enterprise mobility. Attend live for the opportunity to ask your own questions, or feel free to tune in afterward on demand.